“Not to make light of the situation or to be insensitive in any way, but when adversity hits, we deal with it and move forward. That’s what we do,” Yalden said, adding a request to his listeners and readers around the globe to send a prayer and a thought for the people affected. During times of adversity and when people are suffering, we all tend to come together and help if we can, but when things get back to normal, Yalden said we once again get aggravated, short-tempered and angry about many things that really don’t matter. “Sometimes we forget about the little things like appreciation and living in gratitude,” he said, and encouraged every one of us to employ a daily mantra: Remember What’s Really Important. What’s important is being present and engaged – and it’s imperative that you take care of yourself first so that you can then be of service to others. 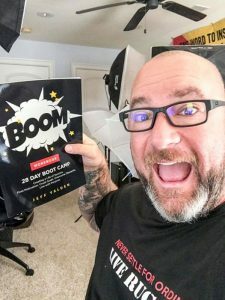 Every day, Yalden has been laying out the principles in his brand-new workbook and planner, The BOOM 28 Day Boot Camp: Creating a Life of Success. These principles will change your life, but only you can do the work. Your written plan should now contain a time frame – so commit to your time frame and your routine for greatness. Your time frame should be structured so that you don’t allow yourself to become distracted. When Yalden was in the tenth grade, he remembers sitting in an assembly, listening to a speaker. At that time, he thought the speaker was the worst. “I wanted the speaker to fall off the stage and break his leg so I could go back to class. That’s how bad the speaker was,” he said. But thirty years later, he can still remember part of that speaker’s presentation – and he realizes now that the same speaker was awesome. Funny how a little perspective can change things, and what that speaker was talking about fits very well into this discussion about having a sense of urgency. Let’s say two people are going after their goals. In this case it’s you and it’s Yalden. You both have plans in place. You are both waking up motivated and are putting in consistent, daily work – improving every day and getting closer to your goals. The person who takes on the sense of urgency is going to get where they are going faster than another person who makes excuses. Your WHY must be greater than your excuses.